Tidal Masters (with MQA) review | What Hi-Fi? In the tech industry, convenience and sound quality don’t always see eye-to-eye – as shown by accessible and affordable streaming services such as Spotify and Apple Music making average sound quality popular again. ‘Premium’ services like Tidal and Qobuz have tried to balance the scales by offering CD-quality streams, but the best-of-both-worlds aspiration truly lies with hi-res audio streaming. But we’re told that anything worth having is worth waiting for – something we’ve been reminding ourselves as the arrival of a true hi-res music streaming service has teetered on the edge of fruition for quite some time. It’s been two years since we first got wind of Tidal working with MQA (Master Quality Authenticated) technology to deliver hi-res audio streaming, and over a year since we first heard the promising consequence at CES 2016. Changes in Tidal’s administration delayed its arrival, but at CES 2017, Tidal launched ‘Tidal Masters’: hi-res MQA streams, available to subscribers of its £20 per month HiFi package. MORE: MQA audio - What is it? How can you get it? You’ve probably heard of Tidal, a music streaming service that’s separated itself from mainstream moguls Spotify and Apple Music by offering CD-quality streams at a slightly more premium subscription price. MQA, first launched by Meridian in 2014 but now a separate company, is essentially a codec technology that packages studio quality music files into a smaller size that’s easier to stream and download – without needing huge amounts of bandwidth and claiming to avoid the sonic sacrifices traditionally associated with audio compression. Tidal says MQA allows it to deliver songs to its subscribers exactly how they were recorded in the studio – regardless of resolution size. If you’re already feeling pangs of excitement, you might want to know how can you get your ears around such files. As well as a Tidal HiFi membership (currently you can sign up for a 60-day free trial), you’ll need to download the Tidal desktop app for PC or Mac. While Tidal also has a web player and iOS and Android app versions, Tidal Masters aren’t yet available on those platforms. Alternatively, you can listen via the MQA-ready Bluesound Node 2 streamer, which connects directly to Tidal Masters files (accessible via the Bluesound app), negating the need for a computer-hosted Tidal desktop app. Before you jump in, some boxes need ticking to make sure you’re getting the Masters in all their MQA glory. In Tidal’s settings, ‘HiFi/Master’ quality must be selected under ‘Streaming’. Listening through your computer or laptop speakers, via its 3.5mm headphone output, or through a connected (non-MQA-enabled) DAC gives the Tidal desktop app the reigns over MQA’s core decoding, which has a limited output of 24-bit/96kHz. In other words, even if you’re streaming a 192kHz file, it’ll only be unpackaged to 96kHz. The benefit of owning (currently limited) kit with built-in MQA decoders, such as the Audirvana Plus 3 computer software – announced at CES 2017 – or Meridian’s Explorer DAC 2, is that all decoding is done by the hardware (bypassing the app in this respect altogether), which can unpackage the entire MQA file for playback in its original resolution. In order for devices to be given the green light, the ‘Passthrough MQA’ and ‘Exclusive Mode’ boxes within Tidal’s sound output settings must be selected. According to the streaming service, Tidal Masters will typically (although not exclusively) be 24-bit/96kHz, as opposed to the 16-bit/44.1kHz (CD-quality) streams on the hi-fi tier. And there are 30,000 tracks currently available in the format. 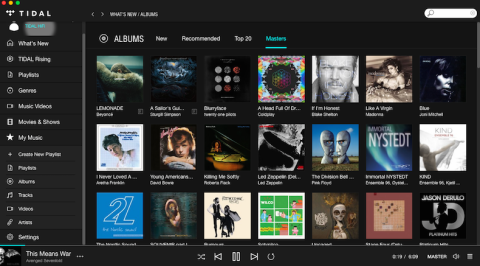 However, only a minority (just over 400 albums) are easily discoverable in the Tidal desktop app, found in the album tab under the ‘What’s New’ umbrella, labelled ‘Masters’. A range of musical appetites are accounted for, however while there are new albums available, including Beyonce’s Lemonade and Sturgill Simpson’s A Sailor’s Guide to Earth, plus albums from lesser-known bands such as The Modern Jazz Quartet and Rhiannon Giddens, the majority are back catalogues of renowned artists, from Coldplay and The Black Keys to Pink Floyd, The Doors, Muse and David Bowie. The other 25,000-odd Masters (such as Fleetwood Mac’s remastered Tusk) are buried within Tidal’s 40m+ database of tracks. Nothing on the library interface flags them up, no track or album information gives it away, and they aren’t searchable in the search bar either. You’ll only know a track is MQA when you play it and ‘Master’ appears in the playback bar. A file’s resolution remains a mystery too unless you own a piece of compatible MQA hardware like the Meridian Explorer DAC 2, which lights up to show whether a track has a sampling rate of 88kHz or 96kHz, or 176kHz or 192kHz. MQA technology isn’t limited to hi-res audio, however. CD-quality files can also be packaged into the codec too, with MQA being a more efficient and better sounding option to the standard WAV or FLAC bundling. We pick a random selection of 40 MQA albums from the ‘What’s New’ section. According to the Meridian, only nine have a resolution of under 88kHz – the remaining 31 are a mix of 88kHz or 96kHz and 176kHz or 192kHz. In an ideal world you wouldn’t need an MQA-enabled DAC for such enlightenment, or have to search blindly for Masters in the service. It would be more intuitive for Tidal Masters to have its own section in the main side-bar menu, where they’re all discoverable, perhaps even filtered into genres like the rest of Tidal’s catalogue. But it’s early days and we expect it will mature with greater functionality along the way. We try it out with an Apple Macbook Air, a £400 Chord Mojo DAC (also, a Meridian Explorer DAC 2), and a pair of Grado SR325e over-ears (£280), and the Master tracks clearly offer the newfound streaming audiophile a sonic upgrade to the ‘hi-fi’ (ie. non-MQA, CD-quality) ones. A 2015 remaster of The Velvet Underground’s Sweet Jane (a 176kHz or 192kHz file according to the Meridian) seems a good place to start – and a revealing one at that. Over the CD quality version, the Master makes more sense of the introductory mash of guitar lines. It’s less disorganised and given more space and expression, can pluck out each intertwining melody, making it sound a lot less like a teenage band’s first practice. As Reed utters “I’m in a rock and roll band”, it confidently clings onto the charismatic delivery of the vocal, which is made more compelling thanks to extra solidity. The strummed acoustic chords that sandwich it carry a greater sense of tangibility, while cymbals can be heard more clearly underneath the fervor. With Touché Amoré’s New Halloween (88kHz or 96kHz – again, as per the Meridian’s reading), the idiosyncratic drumming tows the electric guitar-driven melody so that the track’s convoluted pattern, mostly lost in the CD-quality version, can emerge. The greater impact of brutally crashing instrumentals is proof of the Tidal Master’s dynamic embrace, as is the extra pithiness and force of drum hits. Just as you wouldn’t make the most of a 4K Blu-ray through a poor-performing telly, the sonic advantages of Tidal Masters won’t be as apparent through a budget pair of in-ears plugged straight into a laptop’s output, so investing in a good DAC and headphones (not too dissimilar to the standard we’re using here) is necessary. Tidal and MQA set out on a mission to bring hi-res streaming to the masses, and despite taking a while to get out of the gate, their partnership has paid dividends. As with new technologies, further patience is warranted as we wait not only for support from key manufacturers for more hardware choices, but also other streaming services to get onboard. As Tidal settles to its MQA adoption, we hope interface developments will follow too. But for now, the venture has successfully laid down solid foundations from which the MQA and hi-res streaming experience can only evolve.